Great review! I just saw it today and came to many of the conclusions you did. In many respects, this film parallels HEAT - the cop vs. the robber, each have their own professional code of conduct, the two leads only meet face-to-face once, the climactic shoot-out that results in several key crew members on both sides to die or are gravely wounded, the inevitability of the demise of the protagonist at the hands of his pursuer (well, Purvis didn't actually get the killing shot but he set it up), and so on. But PUBLIC ENEMIES isn't a carbon copy of HEAT and deviates in some fascinating ways. "As he lays dying, he advises Dillinger to let him go, let his girlfriend Billie (Marion Cotillard) go, let everything go and run—like Frank and Neil were also advised to do in Mann's earlier films." Well said! You really tied PE into many of Mann's other films and as I watched this new film I kept thinking, as it looks like you did, how well this film and its themes dovetail into his other films. You can really see what drew Mann to this material. It was a natural fit. Awesome review. I'm posting mine tomorrow. Feel free to host this article at your site, if you wish. I tried finding an email to send it to you, but couldn't see where you might have an address posted. Thanks! Yeah, I linked your review onto the ongoing blogroll. They meet face to face but once in the film, where Dillinger assures Purvis with no small amount of swagger that he has become more inured to the loss of his comrades than Purvis will ever be to the loss of his officers in the line of duty. Bale's expression when he turns his back to Depp reveals that, for Purvis, this is quite true. For me, this is where the film really started to pick up. It felt like everything leading up to this point was the movie getting into gear, and this is when it finally put the pedal to the floor. I love scenes like this, where the cop and crook talk for one brief moment like civilized people...like generals meeting as gentlemen during a ceasefire. Dave: I actually went and saw this movie, partly on your recommendation, mostly on my love of Mann's previous work. I thought it blew for the exact reasons you expressed in your exceptional review. You helped me understand how it fits into Mann's body of work, but that is probably why I hated it so much. It was like watching a less compelling version of Heat. The dialogue was painfully cliche, the robin hood nature of Dillinger was absent of any nuance or layer that would give me pause to reconsider the archetype. My favorite performances were Ribisi's and Crudup(I think) as Hoover. Bale stripped his 3:10 to Yuma character into something unwatchable. Depp was in and out for me. . . Help me like this movie, bro. I recommend Matt Zoller Seitz's review to get another perspective. If you're still not convinced, get back to me. I want you to like this movie, too. Dave: Not convinced. I would go as far as saying that you and this other critic are Mann-apologists! The first three or four paragraphs in which he identifies all of the issues with the film is exactly where I'm at with it. I love the label Minor-mann; it fits perfectly. I do agree that minor-Mann is better than most anything else I get to see. Some of his shots linger: the exhausted breath in the shootout in Idaho, the interrogation of Dillinger's moll. I just do not see a point to the movie at all. Perhaps it is because I am so in love with Heat and Neil's crew that I can't see the value of this film. Each of the members of that crew had depth. It was cool to see them navigate their world, both the intensity of their "jobs" and the normalcy of their family lives. In Public Enemies, that duality is revisited as a more hackneyed version. Let's compare the love interests. Neil's girlfriend, her loneliness is palpable, her attraction to Neil nuanced and complex. Perhaps it is function of the source material, the historical context but Dillinger's girl, strikes me as a stereotype. I can continue on but I don't recall enough of the film to speak about it with the lucidity you professional critics possess. I remain interested in hearing from you further if you have the time. As for the supetube, sort of a surf moniker: short for Super Tubes, a wave in North LA County, and also a section of the wave at Jeffrey's Bay, South Africa. I think I took it on because I was going to blog about surfing way back when. I think what I've discovered about Mann's films (and PE was the first in which I was hyperaware before I entered the theater so it helped in digesting the film) is that my knee-jerk reaction is to see them as technically accomplished but strangely hollow. Over time, and on second viewing, the vacancy I feel in the stories somehow get filled in with things I've somehow worked out in my own mind since the first viewing. Every movie I've ever seen of his just gets better and better the more I see it. It's something I first got a hint of after seeing Ali a second time, then Collateral, but it really hit home with Miami Vice where I realized, to put it in literary terms that you might relate to, that it was a kind of filmic tone poem: sketchy, elliptical, subdued, but nonetheless beautiful. I think he went through a phase in his career where he really aimed for density in his scripts, like in Heat, The Insider, and less successfully, in Ali which may have put him off this altogether. Now, he seems to be aiming for poetry and simplicity. So again, going back to the literary metaphor, he may have had a following based on his work as a cinematic novelist (his series Crime Story was also extremely dense) and this following, of which you may or may not be part of, isn't interested in his newfound exploration of cinematic poetry. 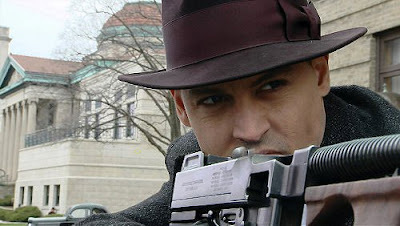 Public Enemies is a movie where you are expected to fill in some major blanks. I don't think it means the film is a major blank. I have a feeling weeks or months later, if you give it a chance again, you'll feel differently about the film. The only advantage I'd say I have over you is that I caught onto this quality of his work earlier simply because I've got more time to focus on his films than you. But if I'm right, and you do come around to this mode of thinking, I don't think you'll ever see one of his movies the same way again. P.S. On a very basic level, there are some that say that films stopped being truly cinematic when sound was introduced into the mix. Can you believe that? Someone denying everything after silents to be cinema? While I don't subscribe to this, I do see what they're getting at. There is a satisfaction of sorts in being able to see a movie, and being able to coherently follow the plot even if the sound is off. There's nothing immature about it (one wouldn't be able to do the same with a Transformers movie, for instance). There's something elegant about it.